Phoebe Waller-Bridge has twisted a traditionally brooding, masculine genre with impressive results. Some of the best-known British entertainment — at least for U.S. audiences — has come in the form of mysteries and spy thrillers. From Hercules Poirot to James Bond, Sherlock Holmes to George Smiley, many of our most famous crime solvers sprang from the minds of U.K. creators. It’s also been a veritable boy’s club. Some showrunners have been working to change this however, and BBC America's new series “Killing Eve” is part of a welcome trend of women taking the lead in British crime serials. Starring Sandra Oh as Eve Polastri, this is a show that would make Helen Mirren’s Jane Tennison proud. Adapted from the series of “Villanelle” novellas by Luke Jennings, the show is a fun, feminist take on the cop versus serial killer trope. Star of the series Oh, best known for her years as Cristina Yang on “Grey's Anatomy,” plays Eve, an American living in London and working as an assistant for a security firm that protects witnesses for the U.K. government on a short-term basis. Bored and frustrated by her job, where her skills are undervalued, Eve has become quietly obsessed with serial killers, especially female ones. When her newest assignment looks like it may involve a female assassin, Eve dives into the case. “Killing Eve” is part of a welcome trend of women taking the lead in British crime serials. This is a show that would make Helen Mirren’s Jane Tennison proud. But Eve’s quarry-to-be, the Villanelle of the book titles (played by “The White Princess” actress Jodie Comer) is always two steps ahead of her. Before we know it, Eve’s client is dead, and she and her boss Bill (David Haig of "Penny Dreadful") are out of a job. Luckily, Eve's actions have caught the attention of MI-5 in the form of Carolyn Martens (Fiona Shaw of “Harry Potter” fame). Suddenly, Eve is heading up a secret team whose sole purpose is to find out who Villanelle is and take her down. Villanelle, it should be noted, is woman who loves her job. She makes killing fun again. While Eve isn't a 00-agent (no backflips from a moving car into an airplane here), Villanelle is up there with the best of the Bond villains, gallivanting around Europe and creatively taking down a list of kills devised by shadowy superiors. “Killing Eve” draws from all the stereotypical hallmarks of the mystery-thriller, but those looking for a “Luther”-like moody manhunt should check their expectations at the door. “Killing Eve” draws from all the stereotypical hallmarks of the mystery-thriller, but those looking for a “Luther”-like moody manhunt should check their expectations at the door. The show is written by Phoebe Waller-Bridge, the writer and star of “Fleabag” — one of the sharpest and funniest dramas of the last decade. And her American accent aside, Oh is far too sunny and funny to be a put upon, Sherlockian bloodhound. But what really makes “Killing Eve” different from other depictions of British spy-vs-assassin games is that both our protagonist and antagonist are female, prioritizing the show's female relationships. Eve’s marriage to Niko (Owen McDonnell) continuously takes a backseat to her job, and her relationships with both with Carolyn and her assistant Elena (Kirby Howell-Baptiste) are consistently portrayed as more important. Men, when they are around, are either irritatingly sweet or uselessly expendable — when they’re not whining about being inconvenienced. The obvious benefits the female lens in "Killing Eve" makes one ask why we don’t put women front and center in these kinds of cat and mouse tales more often. There are showdowns in the kitchen and in the bathroom, punctuated by a grudging mutual respect. Most of the killings are done via methods more closely associated with female homicide too, whether it’s poisons or hairpins — yet the plot devices never feel stereotypical. The obvious benefits the female lens in "Killing Eve" makes one ask why we don’t put women front and center in these kinds of cat and mouse tales more often. But since “Orphan Black” finished its final season in August of 2017, new offerings such as “Dirk Gently’s Holistic Detective Agency” have failed to thrive. Meanwhile competition from PBS, coupled with the rise of streaming services that cater to British TV tastes like BritBox and Acorn TV, have made BBC America’s struggle for content and eyeballs all that much more difficult. With “Killing Eve,” it seems BBC America has once again found its groove. Perhaps where the channel really excels isn’t science fiction, but more female-led programming. 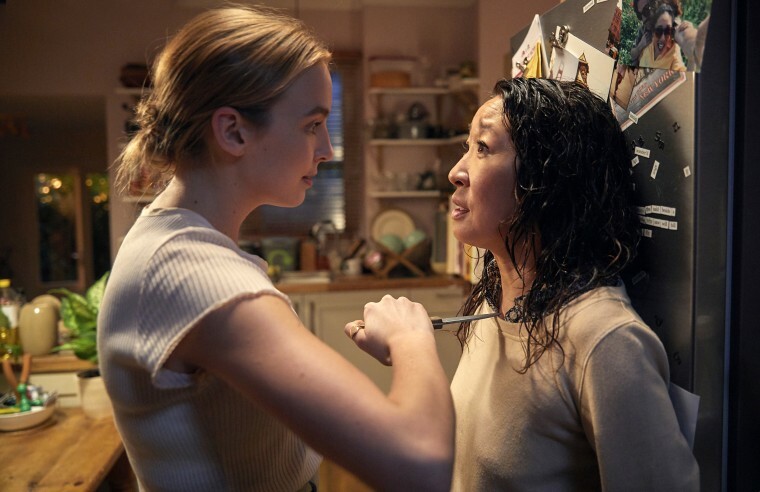 Let’s just hope that Eve and Villanelle don’t take each other down too quickly — or if they do, that Phoebe Waller-Bridge has more amazing female antagonists up her sleeve for Sandra Oh to battle. Because this is a show that definitely deserves a second season. 'American Idol' is back and more patriotic than ever. No wonder it's so boring.